Hi, I'm back again with my watercolor. Its Day 6. Ok, I missed out 2 days of watercolor. Life gets in the way with things to do, my kids' exams period and my girl falling sick. So I'm late by 2 days. To make up for it, I done a more "complex" watercolor. 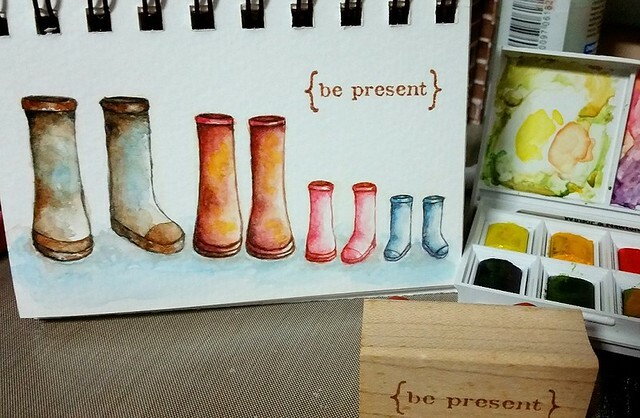 Today's theme is Be Present. I drew 4 pairs of rainboots representing my whole family. Lately I done a raincheck on my life so far. And I realised that I have missed out abit on my kids' development. Ya, I'm a stay home mum but still I find I'm not always "present" in their lives. Sometimes crafting and crafting "business" have taken a part of my time away. And so I want to remind myself to be more present in their lives. Why I drew rainboots? At first I knew I want to draw shoes to symbolise walking together as a family. Then I thought of rainboots because so that we can be united and prepared to weather the storms. I hope you enjoy and are inspired by my watercolors so far. Do try out.